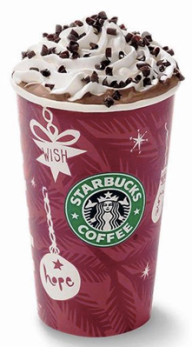 Starbucks: 50% Off ANY Size Peppermint Mocha (Today Only)! Today only, Starbucks is offering 50% off any size Peppermint Mocha from noon to closing at participating US + CA stores!!! Hot, iced or as a Starbucks Frappuccino. CLICK HERE to view Starbucks Facebook page for more information.